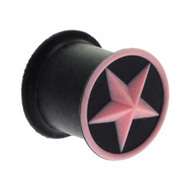 If you like to have fun with your stretchings then check out our range of pink stretched ear jewellery. When we think of stretched ear jewellery it’s usually of traditional metal and wood stretching jewellery but thanks to new body jewellery materials like silicone PMMA and Bioplast, there is a great choice of cool colours out there. Wearing pink stretched ear jewellery is a great way to show off your stretchings and add some colour to your look. Pink is such a happy, girly colour and it is very flattering too. Here at BJS we have stretched ear jewellery in a great choice of colours but I thought I would pick out my favourite pink items for you. Silicone is a fantastic material for stretched ear jewellery and it comes in lots of bright, gorgeous colours. 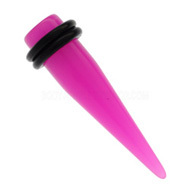 Pink silicone stretched ear jewellery is very popular here at BJS and it’s easy to see why – just look at those candy colours. Silicone has a soft, comfortable feel that makes it unique among body jewellery. This means that you can squish, squash and fold these pieces of jewellery for easy insertion and removal. If you have trouble putting in flesh tunnels youâ€™ll love the ones below. To insert one you just fold it in half, pop it in your stretching and let go – easy peasy. 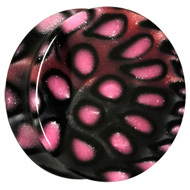 Acrylic is a very durable, lightweight and affordable material for stretched ear jewellery. It comes in a great choice of colours and below are some of our most popular pieces of pink acrylic stretched ear jewellery. The low price of acrylic makes it ideal for when you fancy a change but don’t want to splash your cash. This entry was posted in Acrylic Body Jewellery, Ear Piercings, Silicone Body Jewellery, Stretched Piercings, Stretching Jewellery and tagged Ear Stretched, Ear Stretching, Ear Stretching Jewellery, silicone stretching jewellery, Stretched, Stretched Ear, Stretched Ears, Stretched Piercing, Stretched Plugs, Stretching, Stretching Jewellery, Stretching Tunnels on November 18, 2010 by Piercing Guru.